A crane holds Felix Baumgartner's capsule at the flight line in Roswell, N.M., on Oct. 9, 2012, before the daredevil attempted his record-breaking leap from the stratosphere. An Austrian daredevil will have to wait until Sunday (Oct. 14) for his next chance to beat the world record for highest-ever skydive, and break the sound barrier to boot. Strong winds thwarted Felix Baumgartner's two previous attempts to leap from a balloon nearly 23 miles (37 kilometers) above Earth's surface, keeping him Earthbound both Monday and Tuesday (Oct. 8 and 9). 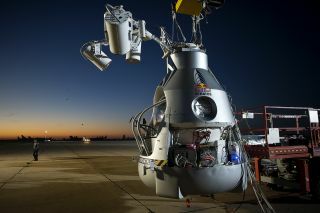 And the weather doesn't look like it will cooperate until Sunday at the earliest, said officials with his mission, which is known as Red Bull Stratos. "Meteorologist Don Day confirmed a Thursday launch is not possible," Red Bull Stratos officials said today (Oct. 10) via Twitter. "The next weather window opens on Sunday October 14th." The weather looked good early Tuesday, so the team filled the balloon with helium and Baumgartner climbed into his custom-built 2,900 pound (1,315 kilograms) capsule. But the winds kicked up in late morning, forcing Red Bull Stratos to scrub the launch at 11:42 a.m. local time (1:42 p.m. EDT; 1742 GMT). That particular balloon is no longer fit for use, officials said, but the mission does have a backup that will be ready for the next attempt. When the 43-year-old Baumgartner finally does lift off, he plans to ascend to 120,000 feet (36,576 meters) and then step out into the void. He would thus shatter the skydiving altitude record of 102,800 feet (31,333 m), which was set in 1960 by former Air Force Capt. Joe Kittinger (who currently serves as a Red Bull Stratos adviser). As he plummets to Earth in a 5.5-minute freefall, Baumgartner should become the first skydiver ever to break the sound barrier, team officials have said. And the daredevil should notch a few other records as well, including longest-duration freefall and highest manned balloon flight. While Baumgartner was frustrated by Tuesday's last-minute abort, he said he's ready to make the jump whenever conditions allow. "I want this to happen this year. We've made it so far. There's no turning back," Baumgartner said after being pulled from his capsule Tuesday. "We're here, we've got the helium and we're good to go. Whether that's tomorrow or the first day next week, I don't really care." Baumgartner has been working up to his record-breaking leap in a stepwise fashion. He jumped from 71,581 feet (21,818 m) this past March, for example, and then dove from 97,146 feet (29,610 m) on July 25.